Tongue is a carbon bike saddle with a deployable fender meant to defeat rear-wheel bike spray on command. The fender slides inside a track on the saddle's shell, underneath a thin layer of gel—all designed to allow bike messengers to ride for long hours in comfort and with convenience. Tongue was designed by second-year students Benjamin Bartlett, Gustav Dyrhauge, Zihan Chen and Tzu-Chin as part of their Product, Brand, and Experience class. The device allows the messengers to slide out Tongue when the rain starts pouring, but slide it back in when the rain stops. They also discovered something that made their product even more appropriate: bike messengers tend to switch between bike saddles depending on their mood, the look, and the weather. And here they saw a design opportunity. 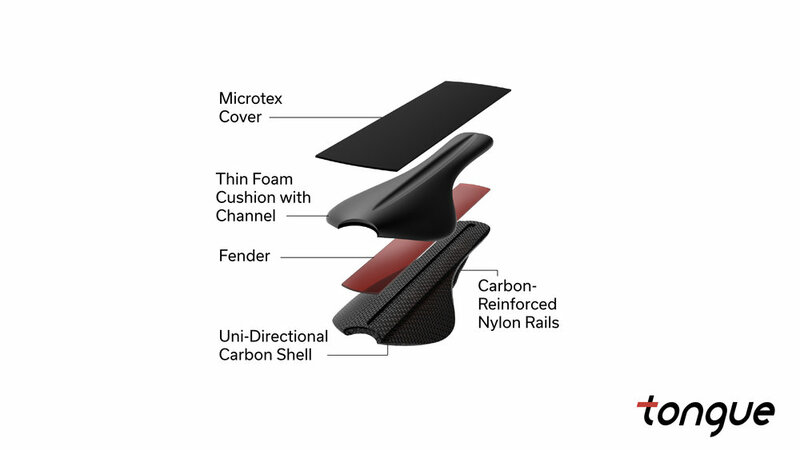 Tongue is a high-end carbon fiber bike saddle, combined with a carbon fiber fender, that smoothly and naturally fit together. This allows the messengers to slide out Tongue when the rain starts pouring, but slide it back in when the rain stops. Bike messengers would rather bike in the rain all day with a wet back from having no rear fender, than having a dry back but looking bad because of a cheap plastic fender.